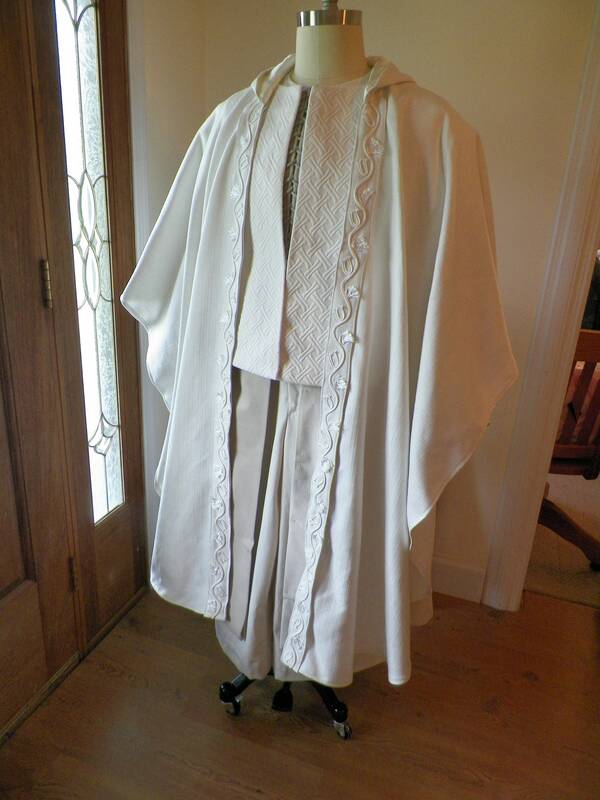 Gandalf the White costume includes five peices. 1. A calf length cloak is included with a hood. 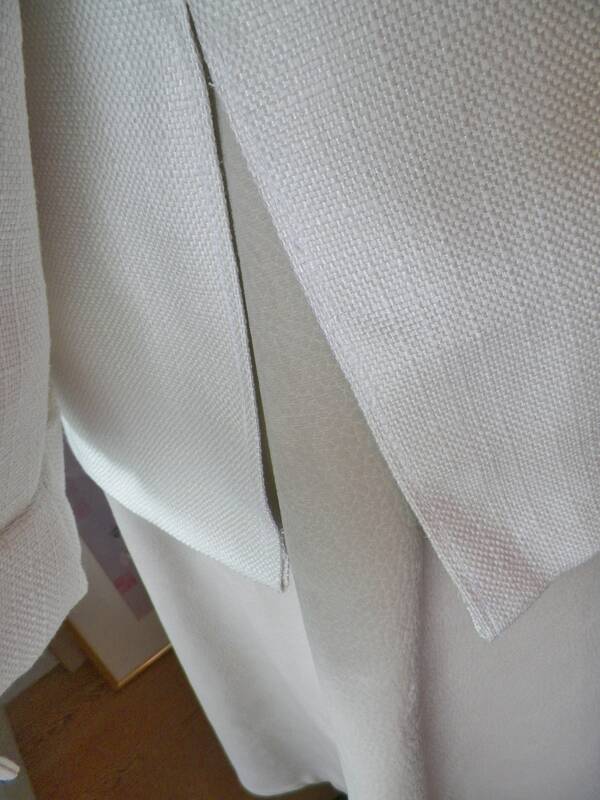 Cloak is made from textured linen in winter white/off white. Cloak has been trimmed in my custom vinework . 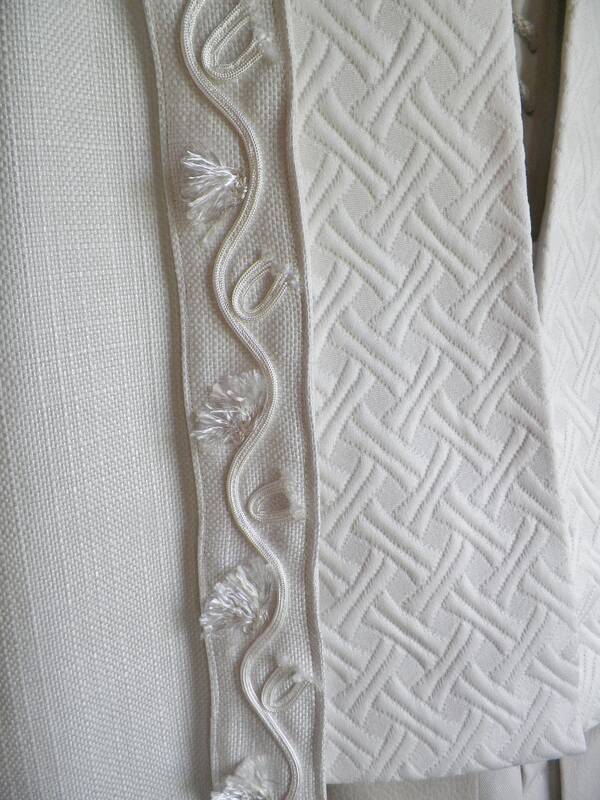 The vinework is made from white silk cording and silk fibers. The vinework trimming is on both sides of the cloak's front opening. Cloak has a hood attached. 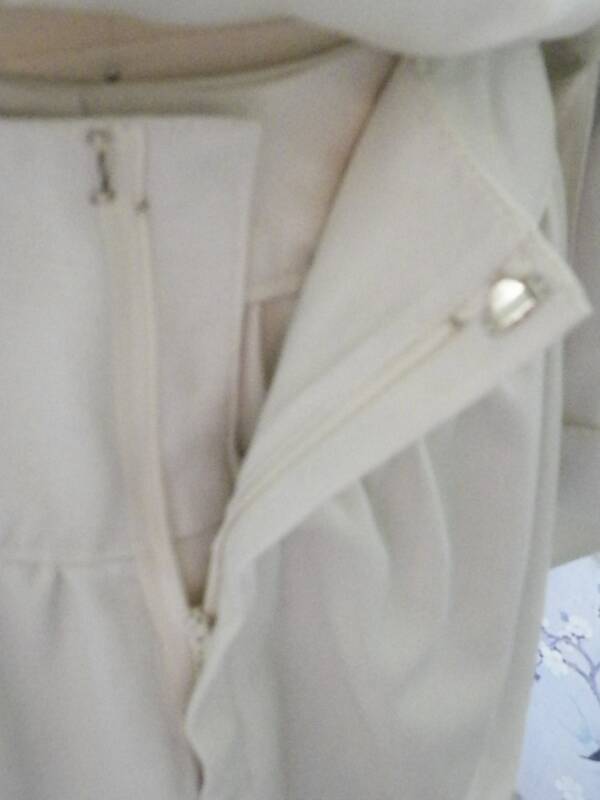 The hood has been lined in creme colored pure silk lining. 2.Outer Tunic is made from a sashiko pattern quilted heavy fabric. A keyhole opening with a yolked collar accents the outer tunic with a knight's appearance. 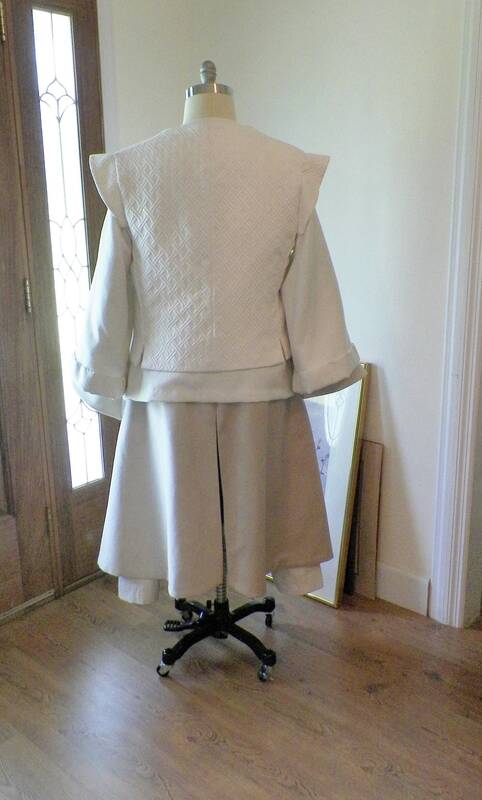 The outer tunic opens and closes with a hidden drawstring panel that laces on the underside of the tunic. The outer tunic is lined in 100 percent cotton. 3. 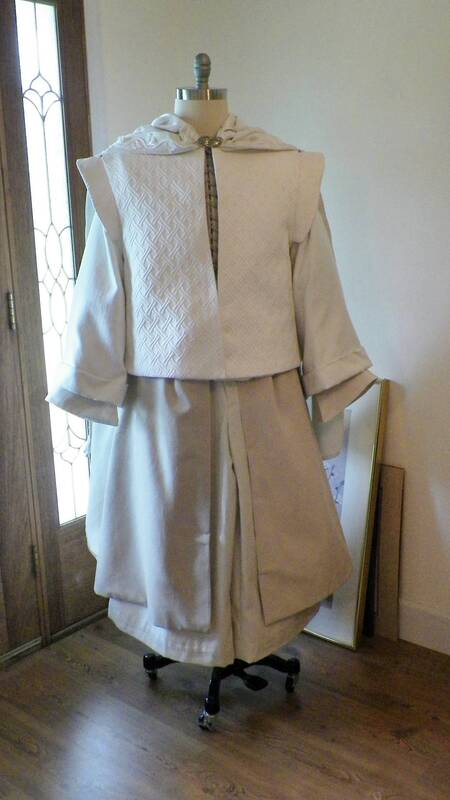 The under tunic is made from textured linen. It has a lace up front opening. Has long bell shaped sleeves with cuffs. Long sleeves will be made based on descriptions on Alleycat. 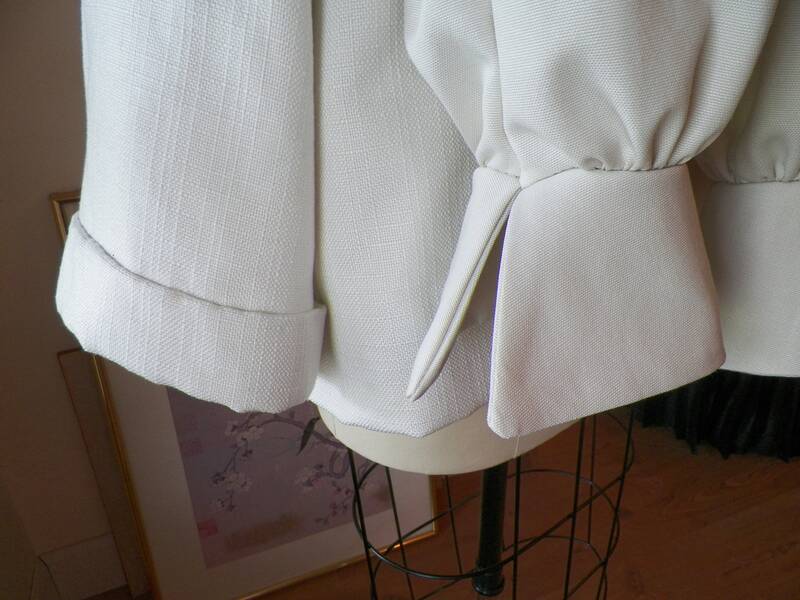 Under the belled shaped sleeves are cotton removable undersleeves. The undersleeves have cuffs identical to the movie costume. 4. The kulottes/split pants/skirt are made from a lightweight cotton canvas in a softened tan. The kulottes open/close with a pant zipper/ hook and bar closure. The kulottes were made separate from tunic for easy on and easy off. 5. A set of chaps are made from a faux leather/suede fabric. The chaps are split in the front and back for horseback riding. The chaps open and close with hooks and bars on the waistband. The chaps are fully lined in the fabric used to build the kulottes. This adds more drama and cohesion to the overall costume appearance. Please contact me to discuss lead time and measurements before ordering. I built the set with your own measurements. Do not order by sizes. I will need good measurements. We all know that sizes can be misleading. Using the measurements you will have the best most ideal fit. This costume is best worn in cool weather. It will be uncomfortable in summer heat. It can be built in lighter weight cooler fabrics. But the cooler fabrics will not have the powerful looks of the authentic movie costume. I believe that a wizard should look very powerful appearance. If you would like to order the Gandalf Cloak only, I will create a custom reserved listing for you. 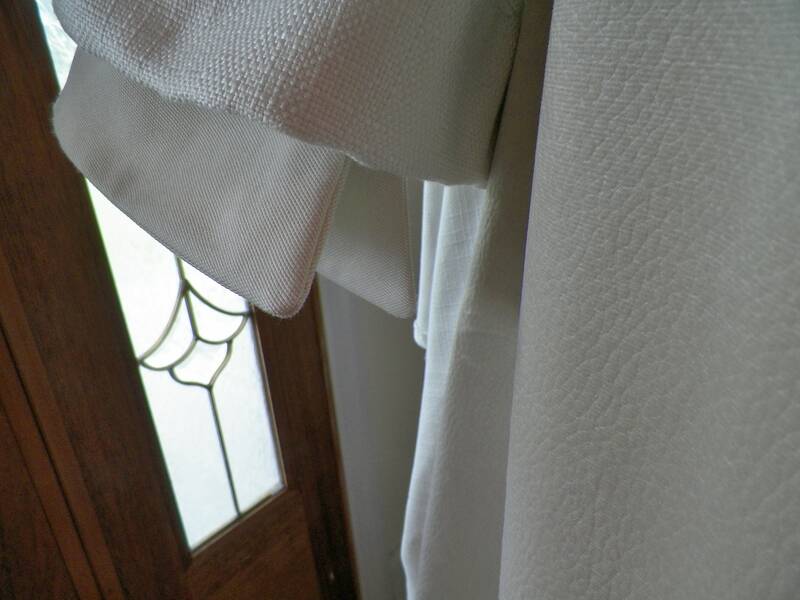 I make the cloak in the textured linen as shown in these pictures. 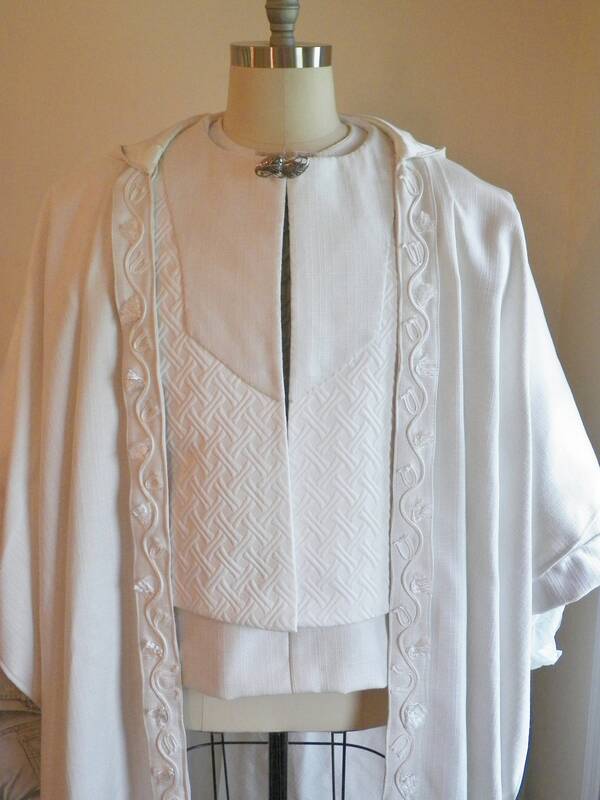 I also make the cloak in double faced creme colored wool. The wool version is very heavy. The cloak has a fabulous hood built in just as shown here in the pictures. If you want cloak made in another fabric let me know. The heavy wool version would need to be worn in very cold climates. Contact me first before ordering, so that we can discuss your timelines. Let me know if you would prefer other fabrics. I need from 6 to 8 weeks to build the costume. I ship priority mail or express mail. If you prefer a different shipper, I can ship UPS, DHL, or Fed Ex. Remember there's custom artwork that has to slowly be stitched into the cloak of this handmade masterpeice. You are welcomed to do a layaway plan...same as split payments. Let me know if you have questions, and thanks for orders, and for stopping by.